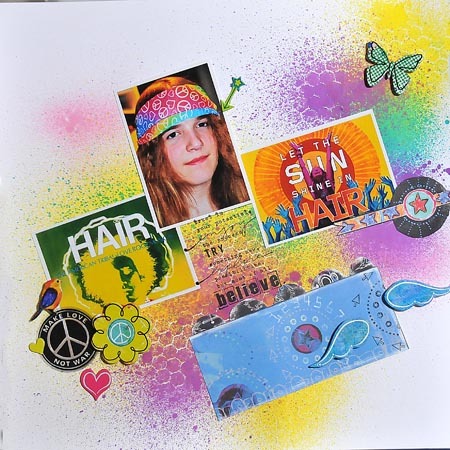 Here is my interpretation of it using Kathy Allan’s 130 lb card stock (available through Canadian Scrapbooker Magazine), some mists, a photo of my awesome daughter Mary Pennington and some printouts from the internet of some promotional images from the stage production Hair back in the day. It’s a great challenge blog with some talented designers and great friends to be made! Come play along!! I managed a few two-page layouts over my holidays. Felt good, haven`t had much time to scrap lately. 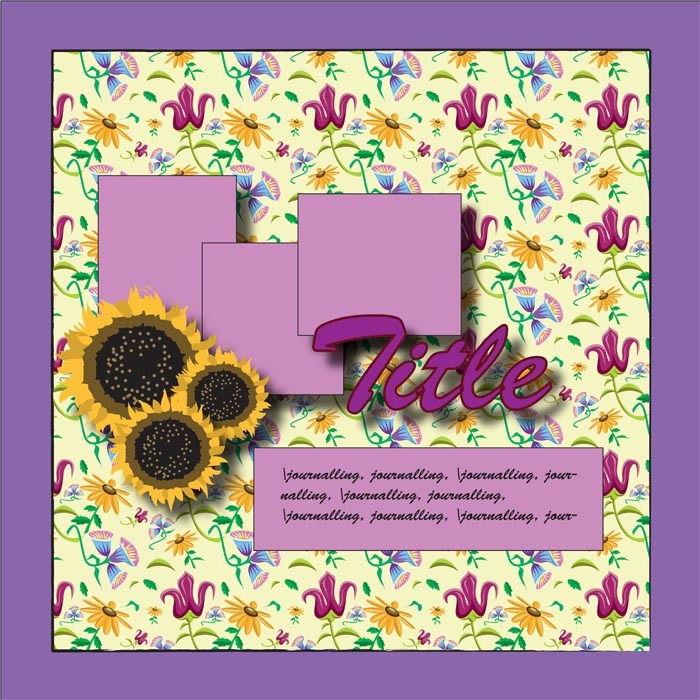 These were Basic Grey monthly layout kits, which I love to save up and use when I am travelling or at crops. Makes it so much easier to pack up and take just what you need when you are away from your own crop space where all your papers and tools are. 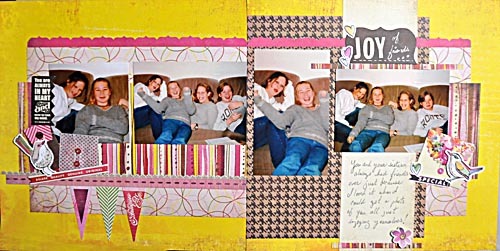 The third layout features our daughter Jacqueline having a weekend get-together with her friend and with her sister Stephanie and her buddy Lindsay. 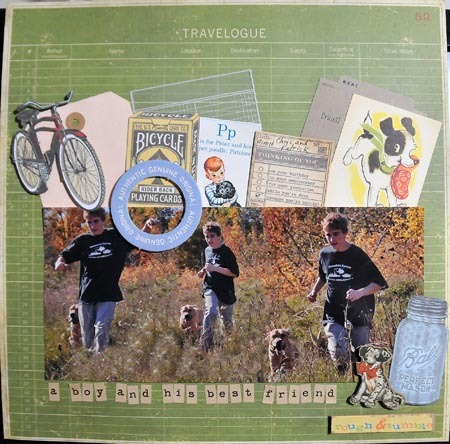 Come on over to Another Freaking Scrappy Challenge … for the 1st of July challenge. The challenge for the first of July is to scrap about YOUR COUNTRY or ethnic group – what it means to you, you dressed in traditional garments, you celebrating the national day for your country, or something else along these lines. The inspiration for this is that on July 1st we celebrate Canada Day here! We used to dress our two youngest children as Evangéline and Gabriel and decorate their wagon with Acadian and Canadian flags to march in the Brighton, Ontario Canada Day Parade for years. (For my non-Canadian friends, Canada Day is the day we celebrate our country – July 1st). Dressing the kids as the story and flying the Acadian flags was a way to honour my Acadian roots, and Chris and Mary were adorable and proud in the costumes. For those who do not know, Acadian people in Canada mainly live on the east coast, are of French origin, and are ancestors of those who were expelled from Canada by the British down into the United States back in the 18th century. Evangeline and Gabriel were the subject of a poem by Longfellow. Google their story – it is lovely. Anyway, if you dig a little further you will find that American Cajuns are Acadians who stayed in the States after Acadians began their long trek back into Canada years later. Their dialect is derived from French. Chris and Mary always looked so cute in costume, and as they got older, they got involved in the wagon or bicycle decorating themselves. They often won first prize for their participation, and have the trophies to help them remember the days!! 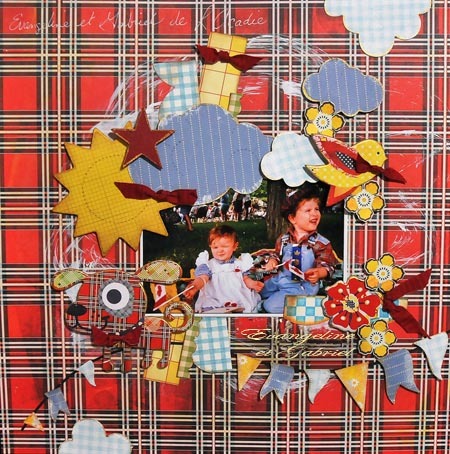 I used Basic Grey June Bug Vintage Plaid paper for my background, some leftover Sassafrass (LOVE THAT SCRAPBOOKING LINE, so sad they no longer manufacture scrapbook paper and embellies) scraps, along with Basic Grey June Bug designer chipboard pieces. I added the white to the background and the clouds using white gesso, and had a blast making the banner. Gold trim was added to many of the pieces using some gold coloured Smooch. Love that stuff!!! Ribbons from my stash.